"The National Turfgrass Evaluation Program has rated Barenbrug’s Advantage Pinnacle III as one of the highest in perennial ryegrasses for home lawns." "Designed to absorb more water than typical lawn seeds and can retain that moisture twice as long as uncoated seeds." "Tall fescue works under almost any type of lawn condition, from bright sun to densely shaded areas." "Hard fescue, sheep fescue, chewing’s fescue and creeping’s fescue, this mix can breathe new life into most any lawn that is stressed from harsh weather conditions." "Can keep a lawn green all year long. It works best with Bermuda and Zoysia grasses." "The mulch of pelletized paper in the mix...helps to keep the little seeds moist and happy and firmly in place as they take root." "Mix of perennial ryegrasses and fescue and contains anti-fungus chemicals to keep the grass from succumbing to fungi that typically enjoy shaded areas." "The mix of perennial ryegrass varieties grows well in sun or partial shade and requires little maintenance once it hits the dirt." "Handy shaker contains a blend of super-absorbent growing material that allows the seed to sprout under most any condition." Ryegrass is a favorite among lawn enthusiasts for its shine and thick carpet of bright blades that grow fast and even. 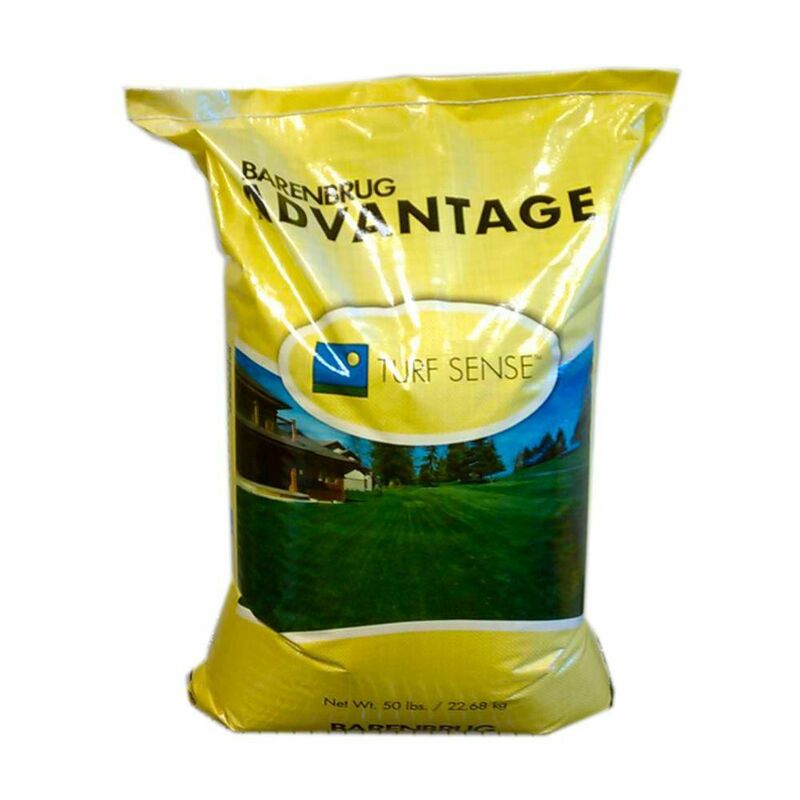 Barenbrug’s Advantage Pinnacle III Perennial Ryegrass Seed offers a disease resistant quality seed in a 50-pound bag. The reddish colored seed heads sprout into a fine leaf texture to give you a dark emerald green expanse of lawn within weeks. It will usually begin to establish within 10 days, even in difficult conditions such as clay soil or with a lack of regular watering. The National Turfgrass Evaluation Program has rated Barenbrug’s Advantage Pinnacle III as one of the highest in perennial ryegrasses for home lawns. If you have a spot that seems to get scorched by sun all day long and shun your efforts to bring green to the barren space, Scotts Turf Builder Sunny Mix Grass Seed may be just what you need. It works well in open areas that receive little natural shade from buildings or trees. It is drought resistant and will thrive with little attention, water, or layers of fertilizer. The seed is designed to absorb more water than typical lawn seeds and can retain that moisture twice as long as uncoated seeds. Scotts Turf Builder Sunny Mix Grass Seed is built for filling in bare spots or thickening up thin patches. One three-pound bag can cover a 675-square-foot lawn from scratch or double that area if you plan to use it to overseed. Spot can be a gentle companion for you but a beast for your lawn. The urine and feces left behind from furry friends doing their business on your lawn can leave unsightly patches of yellow or brown blotches in the otherwise lovely stretch of lawn. Don’t let all your hard yard work go to the dogs. Scotts EZ Seed Sun & Shade Dog Spot Repair can bring back the beauty of your lawn after just a few applications. The 2.4-pound bag of tall fescue works under almost any type of lawn condition, from bright sun to densely shaded areas. Sprinkle the mulched mix wherever your pets have peed, dug up the grass or have paced and created unattractive pathways in high traffic areas. The mix in Nature’s Seed Fine Fescue Grass Seeds Blend is collected from wild land seed collectors and growers to blend with the company’s own choice seeds from its production fields. Made of equal parts of hard fescue, sheep fescue, chewing’s fescue and creeping’s fescue, this mix can breathe new life into most any lawn that is stressed from harsh weather conditions or natural wear and tear. An 8-pound bag can seed up to 1,000 square feet of your outdoor area. It comes in bags that can seed a small 500-square-foot space to larger areas of up to 5,000 square feet. This mix grows well in those difficult places that can get patchy over time, such as dry shaded areas or long stretches of grass that get moderate foot traffic. It doesn’t require much fertilizer and can handle tough soils to stay green long into the season. If you’ve struggled with seeds to get a lawn to grow lush and healthy, it may be you are using the wrong seed for your area. If you live in a warm climate, the Pennington Annual Ryegrass Grass Seed mix could solve your issues in a small amount of time. 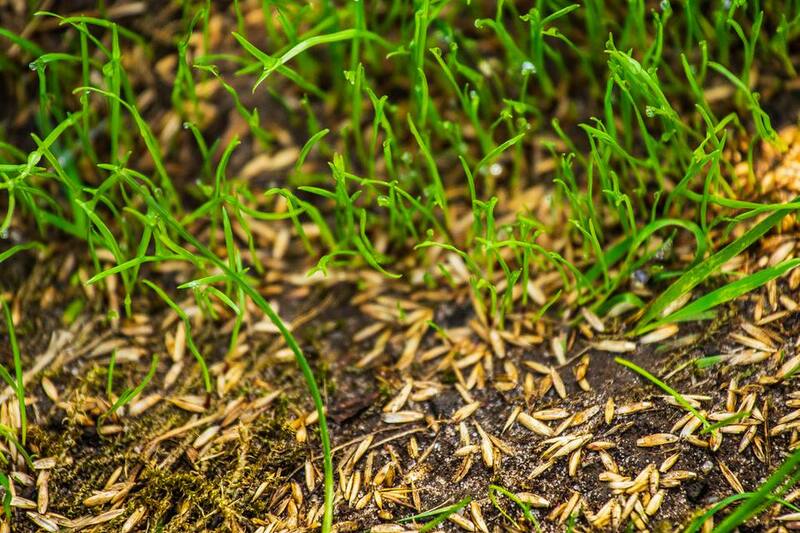 Many reviewers have found bright green sprouts within a few days of sprinkling the warm season hardy grass seeds onto their lawns. The Pennington Annual Ryegrass can keep a lawn green all year long. It works best with Bermuda and Zoysia grasses. The 10-pound bag can cover a lot of lawn, up to 2,000 square feet or more, depending on the amount of areas that need the boost of the fast-growing seed mix. When applied to struggling winter lawns, it can create that lush summer look of your lawn until spring arrives. If you have thin or bare patches popping up regularly, then this grass seed can fill in the unsightly spots quickly. You’ll be ready to mow your lush lawn by the next weekend with the Scotts Patch Master Lawn Sun and Shade mix. The 4.75-pound bag of fine fescues, perennial ryegrasses and Kentucky bluegrasses fill in unattractive gaps in your gorgeous lawn within a week. The mulch of pelletized paper in the mix is 100 percent recycled and biodegradable. This helps to keep the little seeds moist and happy and firmly in place as they take root where they were put down. The mulch helps the seeds to stay put through wind and watering and cuts down on having to reseed those pesky patches. Once the little seedlings begin to sprout, the Scotts Patch Master Lawn Sun and Shade mix has a controlled release of nitrogen to feed them as they grow for up to six weeks. It has a wide coverage and a quick establishment rate. The Pennington Smart Seed Dense Shade mix can bring a cool carpet of lush grass under the thickest canopy of shade trees in your yard. Disease resistant and drought tolerant, the pure-bred grass seed is designed to use 30 percent less water as the seed grows year after year than other grass seed mixes. It grows quick and thick with very little coaxing from the sun. The 7.1-pound bag is a mix of perennial ryegrasses and fescue and contains anti-fungus chemicals to keep the grass from succumbing to fungi that typically enjoy shaded areas to propagate and destroy healthy grass. Lawns are meant to be played on, trampled and otherwise enjoyed by family and friends. When the effects of many little feet running up and down your expanse of backyard haven get to be too much, X-Seed’s Ultra-Premium High Traffic Lawn Seed Mix can fill in the gaps made from all that energy expended on your lawn. The mix of perennial ryegrass varieties grows well in sun or partial shade and requires little maintenance once it hits the dirt. The 7-pound bag can cover 2,800 square feet of lawn that needs help in high traffic areas that are showing signs of hard wear. Lawns thrive when they are planted in quick-draining conditions, such as sandy soil. Scotts EZ Seed Sun & Shade has a high-performance seed with the lawn food packed right into the mix. The handy shaker contains a blend of super-absorbent growing material that allows the seed to sprout under most any condition, from freshly tilled sandy soil in full sun to existing sandy soil that is plagued with bare or thin patches in densely shaded areas. Whether you are overseeding an existing lawn or starting a new turf space, Scotts EZ Seed Sun & Shade won’t let you down. The 10-pound bag of seed is 99.9 percent weed free and has a fast establishment where the lawn seems to be struggling. The mix of ryegrass and Kentucky bluegrass can cover up to 210 square feet of sandy soil, with blades beginning to show within a week.